It is a little-known fact that rugs wear from the bottom up. Foot traffic and movement cause friction on the underside of rugs, resulting in thinning, snagging and aging. Use rug pads to keep your rug in place, and guard against daily wear and tear. 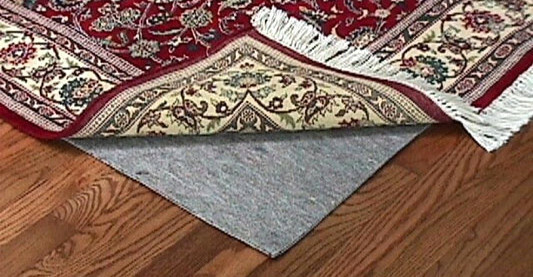 They extend the life of your area rug. Our rug pads are hand washable for easy cleaning. They protect your floor or carpet from color transfer, marring and staining. A quality rug pad makes vacuuming easier. Our rug pads add comfort and cushion to your area rug. Our rug pads are treated with an anti-microbial to inhibit the growth of odor-causing bacteria, mold, and mildew. Our rug pads carry a 10-year guarantee to maintain their anti-slip and cushioning properties with proper maintenance. Play it safe. Use a rug pad to keep your area rug from wrinkling. Our non-slip rug pads help prevent slippage of your rug on linoleum, tile or hardwood floors. And with the benefit of sound reduction, you can enjoy peace and quiet. Our area rug pads are custom designed to accommodate each area rugs specific fiber type, construction, age and client’s specific need. Our padding is proudly made in the United States and is of the highest quality available. For more information on the value of quality rug padding, please click this sentence and you’ll be taken to our video. Custom area rug padding offered throughout the cities of Naples, Cape Coral, Bonita Springs, Estero, Fort Myers and Punta Gorda.